There are many ways to describe a building (particularly if you are an estate agent) but when it comes to pinning down exactly how much energy it’s using — and how energy use can be minimised — then you need to be much more precise. 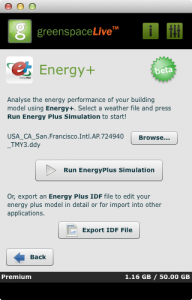 Many modern energy analysis tools approach this problem by having you construct a 3-D model. One problem with this approach is that each of these tools have their own interfaces, and you often need to spend a substantial amount of time learning how they work (and how to avoid their quirks). 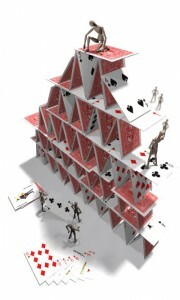 Another problem is that they are often closed systems. Even if you already have a 3-D model created somewhere else, it may not be possible to import it. And once your masterwork of a model is created in one tool, you generally cannot reuse it in another one. At GreenspaceLive we believe in collaboration. We also believe in second (and third, and fourth) opinions when searching for energy-efficient and low-carbon solutions. That’s why our approach to modelling (gModeller) uses Google Sketchup: no new tools or difficult paradigms to master, no awkward interfaces to learn your way around. Just Google’s ridiculously easy-to-use — and free — modelling tool. To that, we’ve added the ability to export (and import) the model in gbXML format. gbXML is an open standard, and is a vendor-neutral way of describing a building (it’s a bit like the PDF of the building-model world). 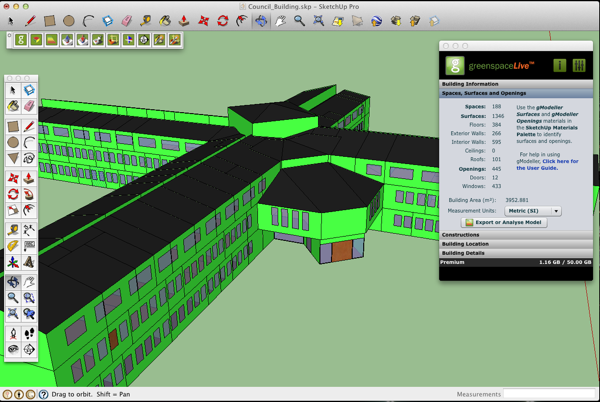 Once you’ve made your building in Sketchup, export it in gbXML format and then import it into a wide variety of other tools for further analysis. 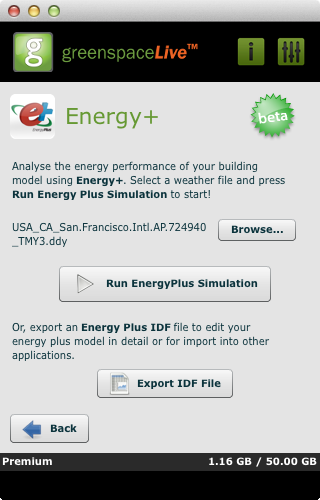 Of course, we provide our own cross-platform energy analysis tool, gEnergy, and we hope you’ll try it first. But you’re not limited to it. As gbXML is totally non-proprietary you can use it in any tool that supports it — see the comprehensive list on the gbxml.org website. Why not start analysing today?